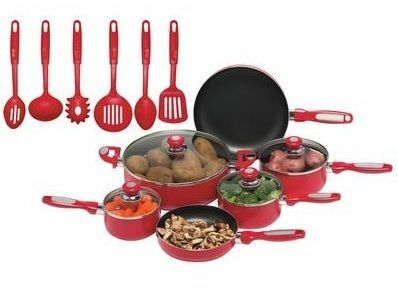 Bright red and ready to cook, the Chef's Secret® 16pc Red Aluminum Cookware Set has everything you need for preparing family meals. Non-stick interior finish for quick, easy clean-up. Pans features vented glass covers, heavy-gauge aluminum construction for fast, even heating, and riveted handles. Set includes: 1qt sauce pan with cover, 1.5qt sauce pan with cover, 2qt sauce pan with cover, 5.5qt pot with cover, 8" frying pan, and 10-3/8" frying pan. Bonus 6 piece nylon kitchen utensil set includes: pasta fork, slotted spoon, solid spoon, slotted spatula, slotted strainer, and ladle. Limited lifetime warranty on pans only (non-stick finish not included). Gift box.